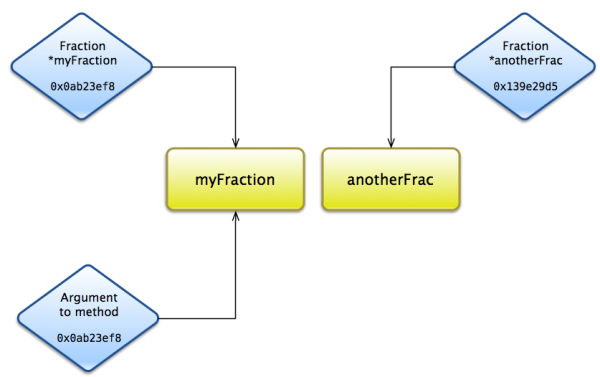 We put an asterisk between the object type and the name of the object (it doesn’t matter if you place it after the type, like Fraction*, in the middle, like Fraction * myFraction, or as above). This is not a typo; we’re saying that we are creating a pointer to an object. At the very basic level, objects are simply a collection of data (and methods). This data has to reside somewhere, and for the most part, this data is located in your computer’s RAM. But some objects can contain a lot of data, and start to take up a lot of RAM. This problem is further augmented if you have many objects. Of course, it’s always a good idea to minimize RAM usage, especially on a platform like iPhone where RAM can be scarce. Pointers, rather than storing an actual copy of an object, simply store the memory address of an object—it points to an object. Therefore, a pointer takes up a lot less RAM than an object itself would. This also makes code more efficient. Pointers “point” to actual objects in memory. A pointer is simply a value that stores an in-memory location. They are generally written in hexadecimal, and look something like 0x0ab23ef8. You don’t have to worry about what they look like, or how they work. They are generally treated as objects, but they aren’t. There only exists one copy of the actual object in memory (unless you explicitly make a copy), but multiple pointers can point to that same object. Multiple pointers pointing to the same object. 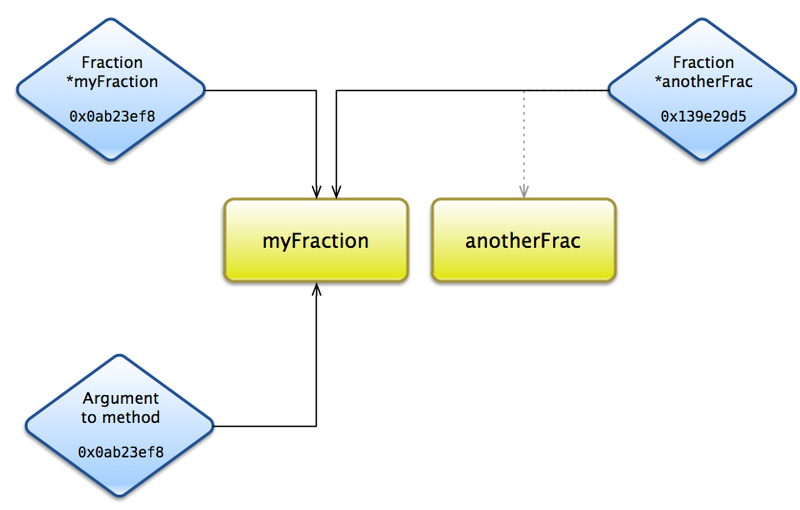 Now, you have no way to get to the original anotherFrac, and so that object will reside forever in memory (or until the application is quit or the system is turned off). This object is considered to be leaked; if you leak too many objects, you’ll run out of memory, and on the iPhone the system will force your app to quit. Regardless of where you are, leaking is not a good thing. Pointers are a central tenet of Objective-C (and all of object-oriented programming). All objects are represented as pointers—the original object is implicitly created. Used properly, they are a great tool.